In the 20-year cohort of American young people who were born in the years from 1998 through 2017 — and will start turning 21 next year — 37.8 percent were born to unmarried mothers, according to data published by the Centers for Disease Control and Prevention. To put that in perspective, the CDC data shows that among the 20-year cohort of Americans born from 1940 through 1959 — who started turning 21 in 1961 — only 4.1 percent were born to unmarried mothers. In 1947, two years after World War II ended, 3,669,940 babies were born in the United States, according to the CDC. Only 131,900 — or 3.6 percent — were born to unmarried mothers. Seven decades later, in 2017, 3,855,500 babies were born in the United States. Of these babies, 1,533,901 — or 39.8 percent — were born to unmarried mothers. Among the 100,538,871 born in the 25 years from 1993 through 2017, 36,913,140 — or 36.7 percent — were born to unmarried mothers. Among the 120,823,472 born in the 30 years from 1988 through 2017, 42,617,637 — or 35.3 percent — were born to unmarried mothers. 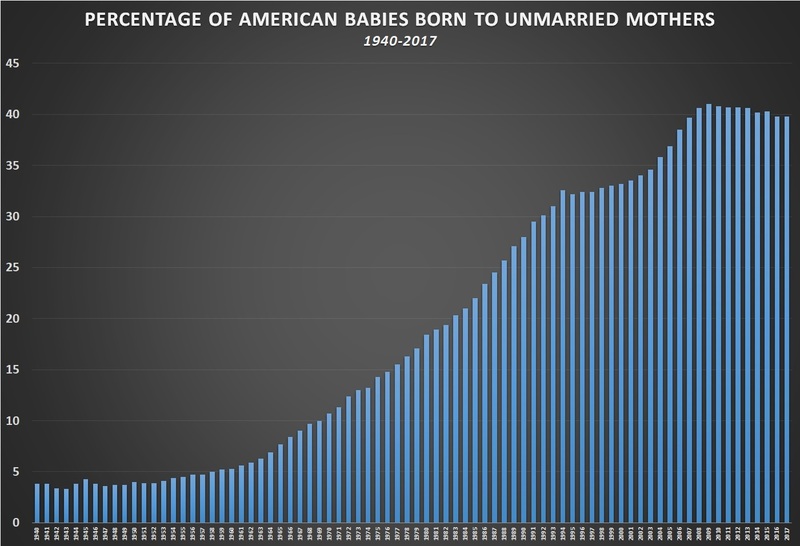 By contrast, 109,066,004 babies were born in the 30 years from 1940 through 1969, and only 5,761,400 — or 5.3 percent — were born to unmarried mothers. In the past two years on record — 2016 and 2017 — it has dipped slightly to 39.8 percent. In 2013, fortunately, the number of babies aborted dipped below a million to 958,700. In 2014, the number dropped to 926,190 — which, sadly, was still more than the 744,600 in 1973.